Commenting in Arte Povera: Notes for a Guerrilla War (1967) critic and curator Germano Celant once stated “After an object has been created, man has to adapt to it.” In contemporary terms, raw materials are largely perceived as potential product and their origins in nature go largely unnoticed. There is little reflection about the nature, context and potential variation inherent to materials, whether manufactured or natural. Yechel Gagnon’s art addresses this question of truth to materials by constructing and deconstructing associations we might typically have with natural materials. For the most part Yechel Gagnon uses wood - a simple resource material - but does so in a most ingenious way. She does not select work with it in its original pristine state. Instead she chooses wood that has already been transformed by the production process to become plywood. While plywood as material is already a standardized “product”, Gagnon takes it one step further by transforming it into art. Her artistic process involves carving, peeling away, cutting, shaving, routering, engraving, and even burning various sections of the plywood. Plywood, indeed, was invented for its strength as a building material and was used by Frank Lloyd Wright, among others, for his Usonian Houses, intended for less wealthy members of American society. It is largely hidden from view in house construction. As a reprocessed material it still looks natural with its age rings, growth holes and knots. There are even sections patched into the plywood during production to fill holes. Gagnon’s manipulations, in her own words involve “constructing landscapes” that reverse the process by turning a manufactured material (plywood) into what look like natural forms. The process is wholly artificial. Plywood, a material noted for its strength and practical use in the construction trade, is, in a sense, as much a “readymade” as the bicycle wheel, urinal, or snow shovel Marcel Duchamp signed. 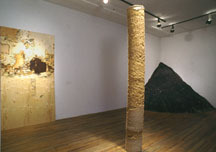 While Duchamp extended the boundaries of art using objects of mass production and design with a sense of irony, Yechel Gagnon has chosen to work with plywood as readymade because it enables her to discover the inherent natural properties of wood buried in the multiple layers of this product material. As a society we do not question where and how materials come to be in their present state, because the production consumption cycle is a one-way process, rather than cyclical and regenerative. The complex layerings of meaning found in Gagnon’s artistic approach to process is not unlike that found in Arte Povera whose intention was to reunite the socio-cultural experience with that of the commodity/object experience. Gagnon’s uncovering of a layered material - plywood - underlines how the transformation of matter from resource to product in contemporary culture involves a loss of context and origin. Yechel Gagnon does this using an elemental organic material - wood - but deals with wood that has been processed or recomposed. 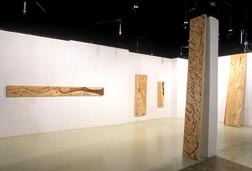 In an exhibition titled Core at Galerie Clark in Montreal (1999), Gagnon, presented not only engraved surface, plywood works but equally reconstructions made from the wood chip detritus of other works. This took the form of a cylindrical eight foot high column titled Petrified Substance and a black ink-stained mound of wood chips (Dune) that though toxic, were beautiful. They sat in a corner of the gallery while ranged around this were four by eight foot plywood sections. Some sections were left uncarved and in their plywood original state, while others were carved and routered. The markings resembled those made by insects in some areas, or the natural forms of a landscape topography in others. Gagnon refers to the process she uses as a form of excavation. In archaeology, excavation involves uncovering a hidden or buried history. The difference with Gagnon’s excavations is that she is uncovering a hidden or buried natural history (that of the wood)in a mass produced construction material. At the same time she is re-eroding this material, but doing this in a non-linear, entirely irrational way. The reconstructions recall the natural forms and variations of shapes found in nature. For Cross Ply (2000) an installation at La Centrale in Montreal, Yechel Gagnon engraved the inner walls of a pre-fab 16’ by 12’ plywood “room”. She incises the interior walls with routers. The surfaces once again resemble giant insect markings and natural erosion or growth patterns. As a re-enactment of natural form, done on a mass produced material in a mock architectural construction that existed temporarily within another architecture (that of the art gallery), Yechel Gagnon’s Cross Ply raised critical questions about the context and nature of artistic production in a highly diagrammatic and re-contextualized way. The structure she created, made to exist within a gallery space - alluded to a higher metaphoric role for the artistic process - precisely because of the temporary nature of the whole gesture that this construction represented. The notion that structures themselves are temporary, the reworking of the plywood layers, made one aware that this process of erosion (Gagnon’s carving) was unnatural and artificial. Gagnon works with plywood as plywood. The uncoverings and erosions of this material’s surface that take place reveal the origins of the wood she works. Her process likewise makes us aware of how unnatural the associations we make with materials in the act perceiving really are. For her current show titled Paysages Laminaires at Galerie Eric Devlin, Yechel Gagnon has innovated with plywood to create what look like induced landscapes. Removing wood sections, and fragments of wood in the ply, she discovers traces, faint lines and jagged boundary areas, that recall the wood’s own (previous) history in the context of nature. For some of these works, Gagnon will even follow the mistakes of manufacture with a router to suggest the form of erosion lines. The effect is of a kind of fictional mapping or topographical layering - the multi-level history of the wood is revealed, and likewise the natural character of the wood surfaces throughout. A series of large scale graphite and charcoal rubbings done from the plywoods on view at Galerie Eric Devlin now form the basis of a show entitled Rubbings at Toronto’s ZYPR Gallery. These paperworks are suggestive of illusionary landscapes. The forms are ambiguous and the spatial dimensions entirely imaginative. The scope and dimensionality could even, in places, be called Dantesque. The resulting graphite rubbings remarkably conjure up representational associations despite the fact they derive from the anomalous carved plywood surfaces of Gagnon’s previous works. The nature-culture discourse is thus given a new twist through the process of transferal between very different media. Gagnon has, for instance, recently printed a series of paperworks produced by embossing from the same already gouged plywood works. The results vary from media to media, and though they all originate from the same source (the plywoods) they are very different. 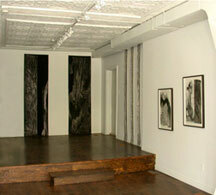 The rubbings are windows we look into, while the embossings are more object-based surfaces. The results of both process variations - one more abstract than the other - derive their strength from the accidental, chance factor, inherent to nature-based materials including wood. The results, like the material and processes Gagnon uses, cannot ultimately be controlled. Other recent Gagnon works recycle the sawdust and wood chip residue that are the detritus of the installations and wall works she has created, inking selected chips and sections of wood, to create printworks whose fragmentary forms are suggestive of imaginary landscapes. The prints she has made with wood chips that are then inked for printing are almost Asian or Oriental in their suggestion of “representational” landscape scenes... Allusions are made to boats, birds, an axe, and there is an almost calligraphic simplicity to the style and presentation. The recent elongated plywood standing sectional pieces on view at Galerie Eric Devlin play on and with line, but also use the natural flow of the lines, knots, textures that are found in the wood, as a backdrop to investigate the contexts that wood - as plywood - in multi levels - and multi layers - can be re-invented in. The process of re-working the plywood is one of discovery. It involves a constant struggle with the materials, which has various strengths and weaknesses specific to it. The struggle results in an effect that can be fluid in places, or broken and jagged, or leave faint traces of forms that lead to other sectional variations. The mistakes in the manufacture likewise can be a starting point for carving into the wood, and the process of elaborating by gouging and carving, eventually arrives at new forms. In two large vertical pieces created specifically for the present show, Yechel Gagnon has played with the contexts and nature of the plywood medium. In one such piece - Mosaic Traces - she has left one vertical section from top to bottom entirely untouched, the middle part of this piece has been gouged and carved, while in the right section, she has uncovered several layers of the plywood. The overall effect achieved suggests a kind of mapping, or re-discovered history inherent to the wood. In a second such piece titled Wood Topography the untouched areas, the gouged and burned sections are more integrated and less linear. The piece becomes a patchwork, of artificial, self-created history, but the wood - its inherent characteristics and history - remains a constant backdrop.